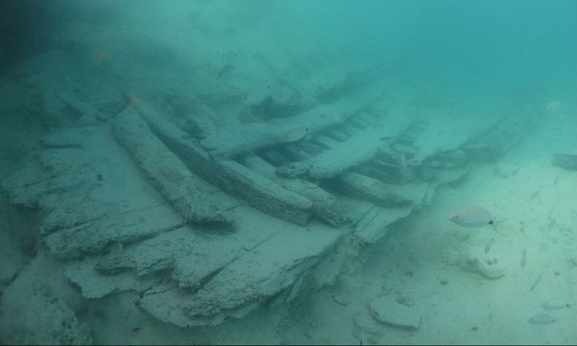 Archaeologists record the details of the timberwork of the remains of the hull of the Warwick. In the first decade of the settlement of Bermuda, 400 years ago in July 1612, communication with England, from whence the settlers came, was through the infrequent ships chartered or owned by the shareholders of the Bermuda Company. Sometimes, as in the case of the Garland in 1619, vessels were waylaid by storms or generally blown off course and could take months to reach the island. The ships brought the necessities of life of the day that could not be obtained in Bermuda, as well as items, such as gunpowder and guns, for the defence of the island, in particular to hold it against a Spanish attack. Not only was life precarious at sea, but given the position of the island in the track of hurricanes, ships were often endangered, along with their cargoes, as they sat at anchor, usually in Castle Harbour. A section of the hull towards the bow may be compared to the archaeological plan. Archaeological plan of part of starboard side of the Warwick, looking at the interior planking. Such was the situation in late 1619, when the Garland limped in after being overdue for some weeks, as she had left Britain eight weeks before the Warwick, which brought the new governor Nathaniel Butler and had arrived on October 20, 1619. The Garland had been within sight of Bermuda three weeks previous, in late October, ‘but she had once again been put off by bad weather, and was forced to the southward, where they lay beating against the wind for so long that their water supply was almost gone, and a great many of her passengers and seamen sick or dead’. Thus from the middle of November, 1619, the Garland and the Warwick rode at anchor in Castle Harbour, awaiting loading of cargo, mainly tobacco. Governor Butler, meantime, was about his official duties and in early December, “he made a journey right through the main island and the tribes, to hold a general assize in Captain Tucker’s grand house at the Overplus”. The Assize took two days, whereupon he returned to St. George’s, only to be met with a late hurricane, which caused the Garland to cut down her mainmast, ‘but the Warwick, which was moored not far from the Garland, slipped all her anchors and was driven onto the rocks, and was completely wrecked’. Governor Butler managed to raise some guns from the shipwreck for the forts and in the late spring went back to the site, with little military success: ‘Some floating barrels of beer were taken out of the hold, but only after a lot of trouble; some of these were in much better condition than was expected, even though they had lain under water for almost six months.’ More guns were taken out of the wreck of the Warwick over the years, so that by 2012, there were none apparent on the site of the 1619 sinking. Except for such removals, the Warwick slowly rotted away, until all that was left, under a pile of ballast, was a section of the starboard side of the vessel, preserved when the wreck rolled onto its right side. After the invention of Scuba diving gear in the 1950s, which made it possible to stay under water for long periods, the investigation of many shipwrecks at Bermuda began, the results of much of which unfortunately for history went unrecorded. The Plain Scale after conservation with inset, a seventeenth-century illustration of such a ruler. In the late 1960s, local diver, E.B. (Teddy) Tucker began an examination of the central portion of the hull remains of the Warwick, noting recently that “when completely excavated, the site will show a good 70 feet of the side of a ship of the late 16th to early 17th century’. It was that goal that the National Museum of Bermuda set out to achieve on an archaeological project on the Warwick that began in the summer of 2009 and was completed in July, 2012. Over several summer expeditions, the volunteer team of Bermudian and overseas students and personnel, led by Museum archaeologist, Dr Piotr Bojakowski and Dr Katie Custer-Bojakowski, uncovered and recorded that starboard section of the hull of the Warwick and produced the plan illustrated here. Such a record is significant, as other shipwrecks of this period, like the Sea Venture, survive only to the turn of the bilge, as their sides from that area to the deck have been lost. Put together with records of the 1609 Sea Venture, archaeologists and maritime historians can begin to obtain a better picture of the ships that, in effect, settled Bermuda and other English New World colonies in the seventeenth century. A number of individual finds were made by the archaeological team, including the earliest known ‘Plane Scale’, a navigational instrument, from a shipwreck, shown here. In addition, Bermudian James Davidson, found what may proved to be the last cannon from the ship, which Governor Butler no doubt would have traded some of the Warwick’s beer to have for his fortifications. James Davidson, who discovered the Warwick cannon, supervises its raising from the seabed. For the time being, the archaeological examination of the Warwick is complete, as far as fieldwork is concerned, but several years of research and conservation of the artifacts recovered are in the offing. Such a project could not have proceeded without the permission of the Bermuda Government and the outstanding support, in kind and in donations, of Rosewood Tucker’s Point, and a goodly number of friends and foundations, to all of whom the thanks of the Museum are extended. Additionally, academic support from overseas institutions was vital to the project, including that from the Institute of Nautical Archaeology, archaeological divisions from Texas A & M University, and scholars from diverse places, such as our old friend, Dr Jon Adams (of Sea Venture renown) of Southampton University. While such scholars may reap academic rewards from their work on the project, it is the people of Bermuda who stand to benefit most from such archaeological work. The results of such research add much to our historical knowledge and the artefacts recovered increase the heritage assets of the island, as they remain here as the property of the Bermuda Government, under shipwreck protection legislation enacted a decade ago.